Obama issued 277 executive orders during his eight years in office, or 35 per year. That’s slightly fewer than the 36 per year that George W. Bush issued and the lowest average since Grover Cleveland, who issued 32 per year during his eight nonconsecutive years in office, according to data from the American Presidency Project at the University of California at Santa Barbara. Overall, Obama ranks 16th among presidents in total number of executive orders issued and 21st in the average number issued per year. Historically, the use of executive orders peaked under Franklin D. Roosevelt, who issued 3,721, or 307 for every year of his tenure. Woodrow Wilson, Calvin Coolidge and Theodore Roosevelt also issued more than 1,000. In terms of subject matter, Obama’s executive orders generally were comparable to those of his recent predecessors, according to a Pew Research Center analysis of National Archives data. Obama, Bush and Bill Clinton, for instance, all used executive orders most frequently to make changes related to government commissions, boards or committees. The next most frequent category for all three presidents relates to government agencies and employees. If Trump does reverse some of Obama’s executive orders, he wouldn’t be the first president to undo or modify a predecessor’s orders. Indeed, Obama issued 30 executive orders that amended or revoked existing ones, according to the National Archives. In one especially noteworthy example, two executive orders by George W. Bush amended an order by Clinton, which had modified an executive order that Ronald Reagan used to revoke a previous order by Jimmy Carter, who first amended a regulatory order created by Gerald Ford. 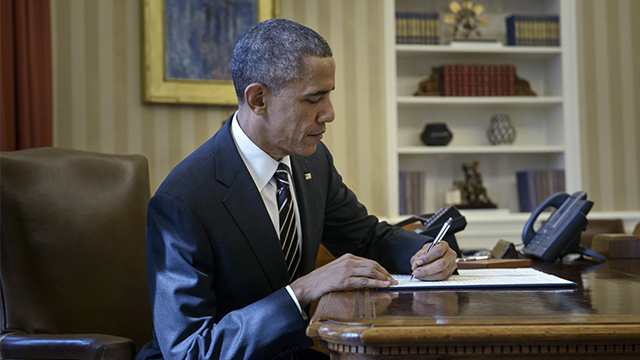 Obama, in turn, eliminated the pair of George W. Bush amendments with another executive order. Correction: An earlier version of this post incorrectly said Obama created the Deferred Action for Childhood Arrivals program by executive order. Note: This version and accompanying chart have been updated from a previous version to include final statistics for Obama.